​We are a boutique ebike shop and have limited number of Ebikes for rentals. During busy times we may run out of Ebikes. Please book in advance to reserve your ebike rental. ​​RideSmart Maui is the combined efforts of two baby boomers, Lee Chamberlain, a former military pilot and retired DOJ Special Agent and Saman Dias, a seasoned entrepreneur from San Francisco bay area who fell in love with Maui 15 years ago. 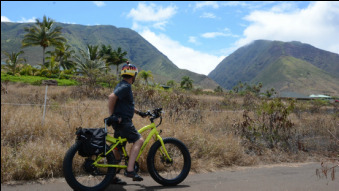 They are enthusiastic about the Electric bikes and its benefits to the Maui community. With their Aloha spirit, Saman and Lee yearn for the opportunity to share the fun experience of green alternative cost-effective transportation, exercise, and recreation with the Maui community and Maui visitors. They invite you to come and rent an electric bike or test ride an ebike to feel the fun of riding an ebike.